The inconvenience caused by the white-topping of city roads is worsening by the day. Now, the case in point is the work taken up near the Shanthinagar bus terminal. The Bruhat Bengaluru Mahanagara Palike has blocked the stretch towards Dairy Circle without providing an alternative road. 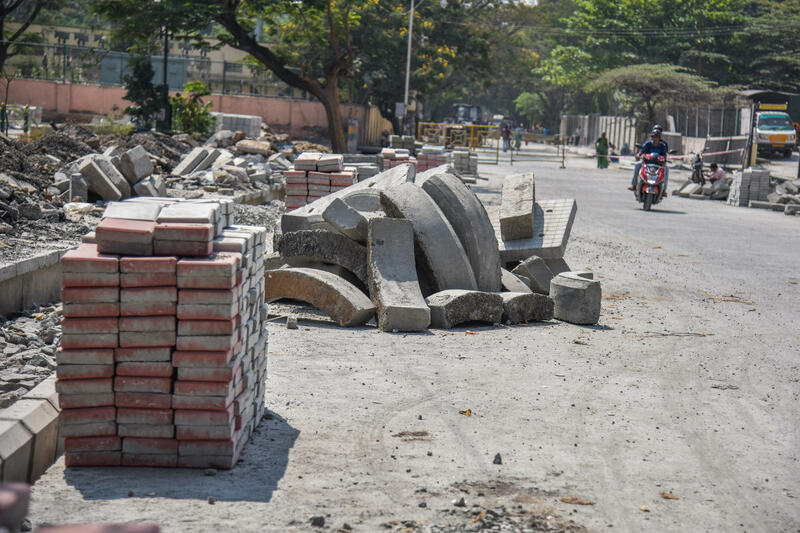 Recently, the BBMP dumped construction material in the area for laying the concrete road. The work on BTS Main Road started about five months ago but is yet to wrap up. The civic body officials said the slow pace of execution is due to the shifting of underground drainage pipelines (UGDs). “Commuting during peak hours on this stretch is hellish. Many of us are forced to take diversions repeatedly to avoid such traffic. But, we still end up spending a lot of additional time on the road,” Mahendra Kumar, a resident of Shantinagar, complained. “We will complete the project soon. We know the traffic pattern in the area. Measures will be taken to ensure there will be minimal impact on the traffic flow,” a BBMP official said. The official, however, noted that the work may take a few months to finish. In the past two years, the civic body has initiated white-topping in many stretches across the city. Nearly 94.5 kilometres of roads in some of the city’s central areas are set for white-topping at a cost of Rs 986 crore.